The precipitous petrol crisis in the country emerged, on 3 November, from rumours by word of mouth, while the line Minister and the Petroleum Development Resources Secretariat kept mum until the delinquency hit a crisis level, and the exasperated motorists started to go on a rampage. The Minister’s request to the public, ‘not to panic’ later, was akin to ‘shutting the stable door after the horse had bolted’. The first official announcement indicated about a tanker full of inferior quality of petrol for IOC, having to be rejected. 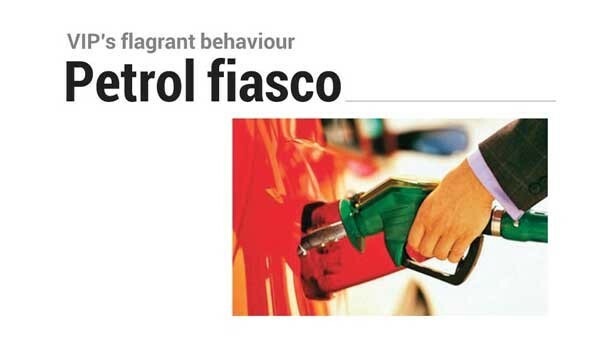 The petrol queues gradually extended, and people started to queue up for hours on end, when the Government announced to the public ‘not to panic’, stating 80 per cent of stocks of petrol was available, while the Indian Oil Company only controlled 20 per cent. Fuel shortages take place, from time to time the world over, and if a single shipment of inferior quality of petrol was able to generate such a pandemonium in the country, it simply boils down to the fact that the Government does not have a cohesive policy! There are ample examples of foreign governments coping up with such critical situations effectively. For instance, the UK Government managed to print out and issue books of coupons, through post offices, to the public, within 24 hours of a crisis involving a tanker driver strike, constraining the issuance of petrol to ‘x’ number of gallons per motorist. Contrary to such measures, in Sri Lanka, the Government was exposed as being hopelessly inefficient, while the panicked, yet selfish motorists started to fill their tanks up to the brim level and took extra supplies too in cans, until a ban was imposed on issuing petrol into cans. This, in turn, made the desperate motorist, who got stuck on the road, ‘out of the frying pan into the fire’ situation, having only two options left, that is, either to abandon the vehicle on the road and walk home or push the vehicle all the way to the nearest petrol station and join the miles long queue, without any assurance that he would be able to get petrol once he approached the forecourt! People have been queuing up in this manner, day after day, and to be advised when they reached the forecourt that all supplies had exhausted. The game of hide and seek by the Government took place from 3 November to 8 November. The Government apologized to the public on 7 November, indicating, the crisis will continue until the end of the week”. However, the latest indications are that, this calamity is expected to end on 9 November, with the arrival of a tanker from Dubai carrying 40,000 metric tons. The million-dollar question that arises here is whether the citizens in this country have to depend all the time on the President to intervene personally, to iron out every miniscule dispute or problem? There is no point in appointing Cabinet sub-committees to investigate once the damage is done. It is inevitable, therefore, for the citizenry to question, the purpose of having countless number of ministers, as puppets, and the public to spend millions on their upkeep out of direct and indirect taxes. By the same token, it is high time to suggest to the Yahapalanaya to at least forget the Yaha (moral) prefix from the Yahapalanaya and to at least concentrate on some Palanaya (governance) by eliminating the bickering and backbiting, by UNP and SLFP Ministers, with a view to get the country on track by eradicating nepotism and corruption, which are allowed to thrive shamelessly. ” What you are doing here is completely wrong. You can kill me on the spot here, but remember that the gun you are using is mine too, I pay for it, I pay for your salary, so your master’s pay and all his allowances. I pay for your boss’s vehicle and this petrol as well. I pay for your children’s education, I do not know who is inside the vehicle, but for the last 70 years, if others, like your boss inside the car, had done what they were supposed to have done, then we would not have queues for petrol like this today“! Having said so, this brave citizen had got into his car and driven off, while the shocked audience, and the stunned and stupefied VIP and his goons, looked aghast. This is what the President should try and put a stop to! Who needs an entourage of vehicles, when there is no terrorist war anymore! The type of citizenship, required in achieving people’s justifications, needs to be effective, particularly in Sri Lanka’s pathetic record. Therefore, masses need to develop courage, have commitment, and possess an individual sense of responsibility towards themselves, their families and broadly towards fellow citizens. None of the so called VIP’s are worth better than any of those killed in the past. There is no need for excessive security now, those politicians should risk lives to get rich using public money. Specially all Ministers should not be given ANY kind of security.